The gelatin will set on the inflatable and feel rubbery at first, however through the span of 24 hours, it will wind up dry and fresh. You can re-plunge the rises after they are simply set to make them darker and progressively tough. In the image over, the inflatable in the frontal area was covered twice in gelatin. The inflatable out of sight was covered just once. I think this makes an extraordinary little end of the week venture. Furthermore, on the off chance that you have kiddos, I can't envision them not having any desire to get included. It's so fun and sort of entrancing, as well! Rather, how about we make cupcakes with air pocket gum icing and utilize an excessive number of sprinkles. 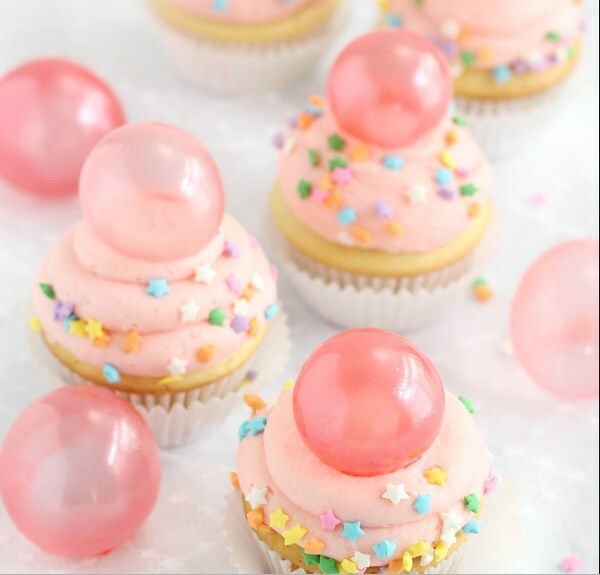 We should be sly and make gelatin bubble toppers, as well. It's simple and I'll demonstrate to you how! Fill a balloon 1/3 to 1/4 full of air. Pinch the balloon at both ends (the blown up/bulbous end and the open end) and tie the two together. This will help the balloon achieve a more round, bubble-like shape. Repeat process with remaining balloons. Balloons tend to attract fibers and particles (hello static electricity!) so place them on a dust-free surface. Brush the balloons with a little vegetable shortening, then use your fingers to completely coat the balloon. Use a paper towel to wipe off most of the vegetable shortening you just applied. There will still be a very thin residue of shortening left behind. If too much of the shortening is left on the balloon, the gelatin will not stick! In a small microwave-safe bowl, quickly whisk together the gelatin, food color, luster dust and cold water. It will become thick almost immediately. Let gelatin stand 5 minutes. Heat the gelatin in the microwave for 10 seconds, or until it is completely melted. Let the mixture stand until lukewarm. Hold a balloon by the knot and dip it into the gelatin, rotating it to coat the sides and avoiding the knot. Hold the balloon upright (knot to the bottom) and allow the excess to drip back into the bowl. Transfer the balloon to the grid cooling rack knot-side down. (I placed the balloon knot into an open grid.) Allow the balloon to dry for 5-10 minutes. Repeat with remaining balloons. Re-dip balloons in the gelatin. You may need to re-heat the gelatin mixture in the microwave for 3-4 seconds. The balloons will feel rubbery at first, but will dry to a firm, crisp shell over a 24 hour period. Visit bit.ly/2uXMAKV for full instructions.